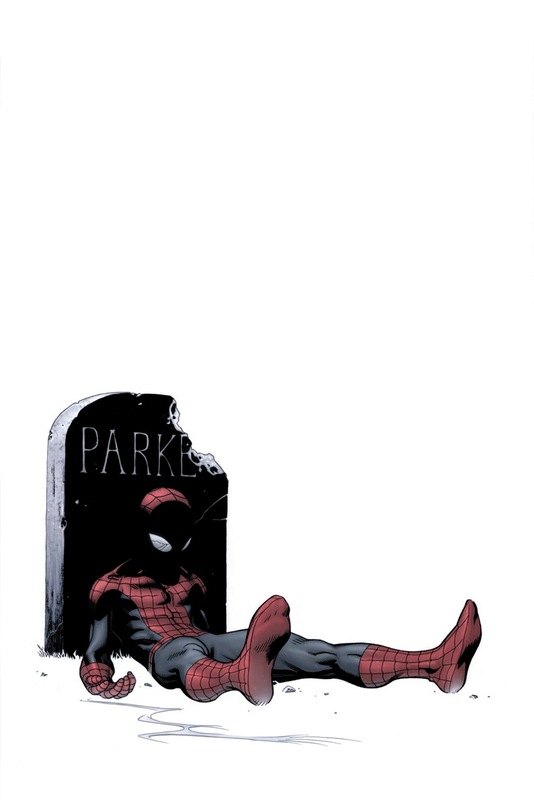 Rest In Peace, Peter Parker. Sunday night, a man made me cry. I, like many others, knew Brian Michael Bendis was going to kill Peter Parker, but wasn’t aware how acutely it would ache to see the webslinger lying lifelessly in Mary Jane’s arms. Spider-Man is dead. Sob. Only, he kinda isn’t. So here’s the skinny, true believers: Peter is alive and kicking and firing quips faster than his webshooter in Marvel’s mainline comic book, The Amazing Spider-Man. This is the series that’s been around since 1963. In 2000, however, Marvel launched another imprint, a fresh magazine called Ultimate Spider-Man, aimed at reintroducing Stan Lee’s Spidey mythos to new generations. With Bendis as head writer, this retelling — with a young teenaged Spidey working at the Daily Bugle website — was fresh, original and devastatingly true to the spirit of the classic character. A younger, more clueless Spider-Man, finding his own way even as, over at ASM, the war-hardened hero battles newer, darker, more intense demons and dares to brave yet another date. And now the boy — all of sixteen and very recently reunited with Mary Jane Watson, the redheaded love of his confused highschool life — is dead, and it bloody well hurts. It hurts because of just how good a job Bendis and his colleagues did with the character, winning over Spidey purists with skill and sincerity. It hurts because a great kid just bit the dust, killed by naïveté and nobility. It hurts because we were just getting used to watching him grow. Lamenting the death of a fictional character might seem like folly to many, but we’ve all felt it happen: teenage girls around the world sobbed when Goose died in Top Gun, or when Shah Rukh did in Darr; their mothers — and mine — took to their kerchiefs when Mihir Virani of Kyunki Saas Bhi Kabhi Bahu Thi kicked the bucket. Innumerable great works of literary genius revolve around the death of central characters, and so besieged was the Strand Magazine in 1893 by readers outraged by the death of Sherlock Holmes that Sir Arthur Conan Doyle had to resurrect that most iconic of detectives, even if he didn’t want to. Bendis wept while writing out Peter’s death, he admitted. His wife, overwhelmed by the sight of a grown man bawling, wondered aloud how come he hadn’t felt such grief when people in their family passed away. Yet it is an understandable emotion, for as we watch a character live and grow — especially in serialised form — his or her glories and foibles help us really get under the character’s skin, to know what makes him or her tick. Truly considered, it is this serialised form that breathes authenticity into the characters, making a sitcom death potentially far more profound than one in a film. We have seen the character grow, we have run into the character over and over again, establishing a reliable familiarity akin more to genuine friendship than anything else. When a character we have come to count on dies, even in purely dramatic fiction — when Colonel Blake died in M.A.S.H, or when that fellow who said ‘I say, chaps’ died in Fauji, or when JK Rowling kills off a lovable primary character — we feel the ache of loss, loss of a familiar comfort, the sort we think we’ll always have. Today, comicbooks may be the best examples of serialised narrative. Characters die all the time, to be honest. They also bounce miraculously back to life, ever since Superman came back from the great beyond. It’s hard to place much stock in a superhero death story these days, with both stables Marvel and DC having massive near-annual events which completely shake up their respective universes only to usually settle down later with exasperating convenience. But this feels different, simply because of how immaculately it was handled. We saw it coming loud and clear — Death Of Spider-Man was splashed all over the press long before Peter stopped breathing — but it felt like a trainwreck anyway. Bendis assures us some new kid, galvanised by Parker’s death, will pick up where he left off and be the new Spider-Man, and — now that we’ve seen this gutwrenching tragedy — that seems easy enough to believe. I know I’d pull on the costume in a trice. Man, I suppose at some point you would write something I disagreed with. I didn’t like Bendis’s Spiderman. It started of great before I realised I was reading a comic book where every character spoke. with a fullstop. every. second. word but sometimes…..he would throw in! a dramatic pause! Its like he grew up writing Shatner speak! And maybe this is an age thing but I really, really, really couldn’t take another long run of teenage emotional nosense which Americans specialise in but sadly give their characters the emotional fortitude of a 5 year old child who has had their favourite toy taken away. But, I godamn loved his Uncle Ben. I finally realised why Peter loved him so bloody much. Very few characters have such a short presence but so great an impact. Alternatively, J. Michael Straczynski’s long, long run on Amazing Spiderman is…well, Amazing. :) And I loved the whole religious totem angle thing he introduced early on during his run which showed a whole new side to Spiderman’s powers and significance which I never realised before. Not to mention there was an incredibly strong focus on his personal life, especially when he was a teacher. Those were some of the strongest self-contained stories i’ve read about Peter Parker. I think Marvel realised Peter is really the only solo superhero they have who matches Superman and Batman in global impact, recognition and significance and thankfully they let Strazyncski let him do his thing. Best of all, this run ran alongside the greatest super-hero team series ever written – Grant Morrison writing New X-Men. Sadly, Marvel threw everything away after that with M-Day, Civil War and the complete mess after that. Don’t even get me started on Spidey’s deal with Mephisto (*spit*). It says something that I enjoyed World War Hulk so much that Richards, Stark and the others deserved the utter beating Hulk gave them.